A favorite dish at this time of year features the last of the celeriac stored the root cellar. 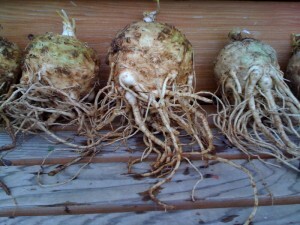 And in a bit of poetic symetry it’s also time to plant the next season’s celeriac seeds. Each year I grow more of this lovely winter vegetable. It’s hardy,isn’t bothered by pests (except voles! ),doesn’t take up much space in the garden though it needs the entire season to grow, and stores beautifully in the root cellar. Contrary to it’s gnarly appearance, this is a highly refined root vegetable with a gentle, slightly celery-like flavor that enhances so many winter dishes –mashed potatoes,soups and stews,roasted veggies,or eaten raw as classic French salad. The dish we made last night,and every year,involves juicing the celeriac – a profligate use of such a slow-growing vegetable! The resulting juice is lighly boiled with a little cumin,salt and pepper,strained and used as subtly flavored broth,delicious with mushrooms and broiled fish. We sprinkled the dish with little bits of greens,chives and herbs from the hoop house. First and last harvest together. Lovely. Unlike the celeriac,which was in perfect condition,the remaining pound or two of parsnips in the root cellar were starting to sprout and get pithy so I removed them too. I was all out of my favorite herbal tea ingredient —roasted dandelion root —so I decided to roast the parsnips for tea. It’s very easy and delicious. Clean and trim the roots,cut them up coarsly and toss into a food processor to grind them up. Spread the finely ground roots onto cookie sheets that have been warming in the oven set to 300 degrees. Remove and stir the roasting roots every 15-20 minutes and when the roots are the color of black tea,they’re done. Cool and store in a jar. Make an infusion with boiling water just like any other herb tea,plain or mixed with other herbs. A nice after dinner tea. I’m sure I’ve seen those tentacled creatures in one or another special effects space adventure scene –so now I know where they got their inspiration! Thanks for the inspiration! Gambatte! Thanks,Bill. Now I will always think of celeriac,not as creatures of the earth,but of space! 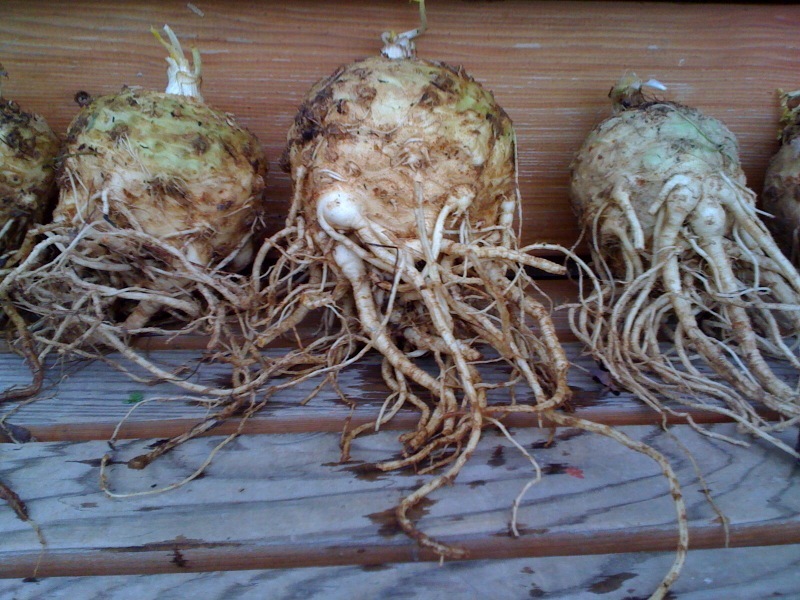 When you buy one of these guys at a store or farmers market,they’re sold with the tentacles removed so you don’t get to experience the otherworldly aspect of celeriac unless you grow them. I find the tentacles to be great additions to any soup stock.